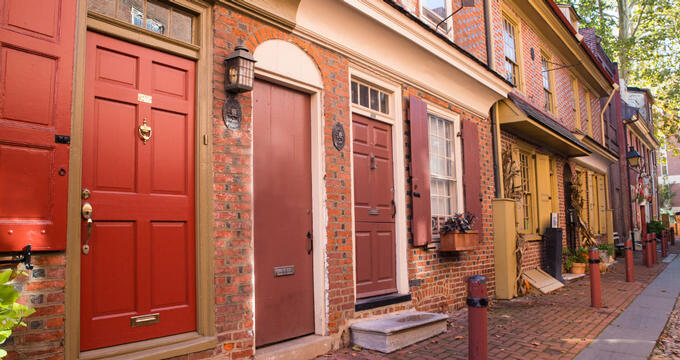 Couples looking for a fun night out in Philadelphia have a wide variety of options to choose from, from seven-course prix-fixe menus and restaurants helmed by celebrity chefs to casual cafes, laid-back craft beer taverns, and hip music venues offering late-night bar service. 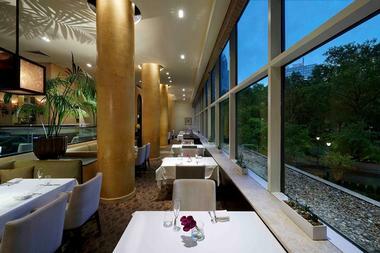 Lacroix is an award-winning French-influenced restaurant located in the luxurious Rittenhouse Hotel in central Philadelphia, which opened in 1989. The restaurant is a consistent winner of food industry awards nationwide and has topped local best-of lists and travel rankings every year since its opening. Lacroix's second-floor setting offers sweeping views of Rittenhouse Square, which compliment its signature innovative cuisine. Private dining options are available for guests looking to dine in a more intimate setting, including a Chef's Table experience that is available for up to six guests. Breakfast, brunch, lunch, dinner, and high tea menus change frequently, with an acclaimed wine list available to complement all meals. Stogie Joe's Tavern is a laid-back neighborhood pub serving home-cooked comfort and bar food in south Philadelphia. The restaurant was opened by the Leuzzi family in 2008. Since its opening, it has been named to several local best-of lists, taking the top spot on Thrillist's list of best pizzas in Philadelphia for their signature pizza topped with fresh-baked dough and homemade sauce. Other menu options include pastas, burgers, sandwiches, and bar appetizers, along with an extensive drink menu featuring cocktails, wine, and draft beer. In addition to food service, Stogie Joe's hosts a variety of events throughout the year, including trivia nights, live music performances, and community block parties. Visitors should note that Stogie Joe's is a cash-only establishment, though an ATM is available on site. 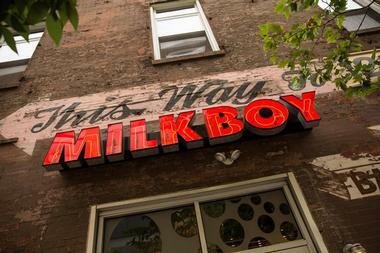 MilkBoy is a bar, restaurant, and live music venue that is an extension of the famed MilkBoy recording studio. The iconic Philadelphia studio, opened in 1994, has served as the recording site for major albums by internationally-renowned artists such as Erykah Badu, Miley Cyrus, and The Roots. Its downtown restaurant opened in 2011, offering a full menu of locally-sourced food that includes vegan options. Milkboy is open daily, serving breakfast, lunch, and dinner, and has a unique early morning happy hour on weekdays with a full menu and drink specials, making it a hotspot for overnight medical workers in the region. 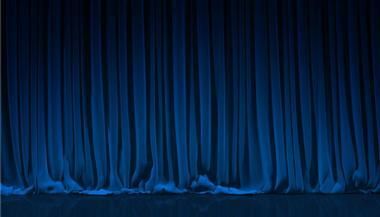 Two bars are also offered onsite, along with a ticketed music performance venue that brings in local and national touring rock, pop, and R&B acts. The Trestle Inn has been serving the Spring Garden neighborhood for more than a century, and despite changes to the ownership and the neighborhood, the bar has remained one of Philadelphia's most popular nightlife spots. After a fire closed the business briefly in 2010, the Trestle Inn reopened in its current incarnation in 2011, which has been named among the best bars in the city. The bar is known for its retro theming invoking the heyday of 1960s and 1970s nightlife, including classic cocktails and spirits served at its bar, disco and Motown hits spun by DJs, and go-go dancer performances on weekends. A full menu of old-fashioned bar food is also available. Special event nights hosted at the bar include guest DJs and tributes to iconic midcentury musical artists. Matt and Marie's is an Italian sandwich shop and breakfast spot opened in Logan Circle in 2014 by husband and wife team Matt Sapolsky and Marie Capp. The chain was expanded in 2016 to include two other Philadelphia locations, including a Rittenhouse Square location and a downtown location at Arch and 18th Streets. 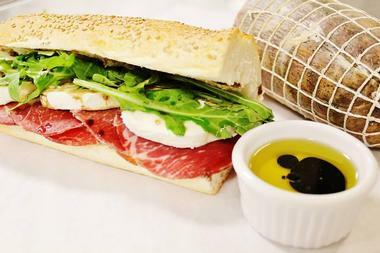 It specializes in high-quality ingredients, with all sandwiches crafted with imported cheeses, aged fine meats such as coppa and finocchiona, and housemade spreads and toppings. Signature salads, bagels, breakfast sandwiches, and fresh-brewed coffee are also available for dine-in, take-out, or catering, with vegan, vegetarian, and gluten-free choices available. 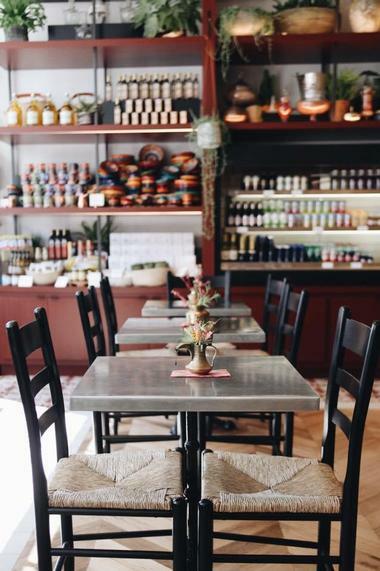 Surya is a Lebanese cafe restaurant with a market and outdoor garden space, opened in 2018 in the city's busy Fishtown neighborhood. The restaurant was named as the Best New Restaurant of 2018 by Philadelphia Magazine and offers all-day service, including weekday lunch, weekend brunch, and everyday dinner service. Menu options include traditional Lebanese fare, such as a selection of hummus types, man'oushe flatbreads, and expertly-prepared meats. Coffee, pastries, grab-and-go-selections are sold at the restaurant's market for to-go service, along with a variety of kitchen necessities and dinnerware. Outdoor dining and drinks are available in the restaurant's garden area, which features a fire pit. 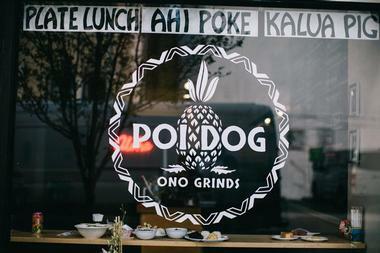 If you are craving Hawaiian food in Philly, Poi Dog is your best option. Located in the Rittenhouse neighborhood of Philadelphia, Poi Dog is a counter-service restaurant serving fresh ahi poke, Hawaii-style plate lunches, musubi, and mochi flour desserts. All their hot dogs are great and so are rice plates that you can mix with fried chicken, mocha nori, or pickled red cabbage. Their poke bowls are delicious too. 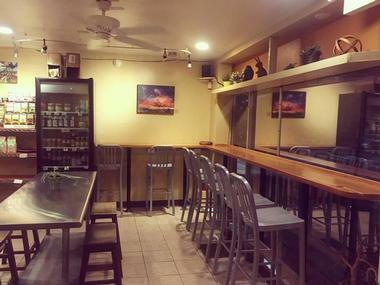 The place is small and basic but it is bright and clean and has a fun large mural on the floor. You can eat there or take your meal to go. The Good King Tavern is a casual French-inspired pub run by father-daughter team Chloe and Bernard Grigri, offering dinner, brunch, and an extensive selection of wine. The tavern was opened in 2013 and has frequently been ranked as one of Philadelphia's best restaurants. Its decor is designed to evoke the atmosphere of southern France's Provencal region and features accents such as industrial lighting, exposed brick, and tin ceilings. While the tavern always offers French cuisine standbys such as oysters, mussels, charcuterie boards, and croquettes, most menu options change daily and are displayed on a chalkboard listing for guest. In addition to wine selections, a wide variety of beer and spirits are available alongside a selection of authentic French desserts. Hungry Pigeon is a relaxed cafe in Queens Village, opened in 2016 by chefs and longtime friends Scott Schroeder and Pat O'Malley and specializing in food made from locally-sourced ingredients. 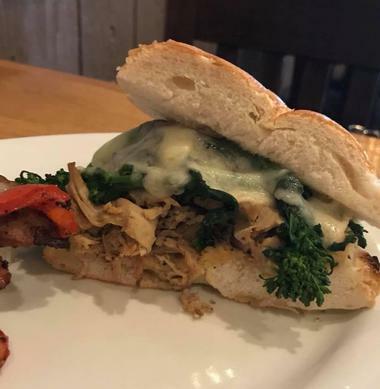 During the day, the Hungry Pigeon offers counter service and casual seating at its tables, with coffee, breakfast sandwiches, pastries, snacks, and lunch items such as salads and sandwiches available on its brunch and lunch menus. In the evenings and on weekends, the restaurant becomes a full-service facility, with seasonally-changing menu offerings and the option to order a four-course Chef's Tasting meal. A large wine list is available, along with a variety of cocktails and draft beers. A selection of desserts is also served, including sorbet and pie options. 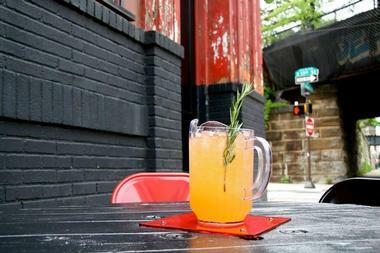 Martha is a bar in in the Fishtown-Kensington area of Philadelphia, opened in 2015 by Jon Medlinsky, Cary Borish, and Mike Parsell. The bar is located in a former warehouse and features standard bar seating along with an indoor loft and an expansive outdoor patio seating area. It is dedicated to crafting dishes with locally-sourced ingredients, with an emphasis on fermented fare. Food options include hoagies made on locally-crafted bread, pickles, vegetable platters, and charcuterie. A large drink menu also features a variety of local draft beers and ciders, along with craft cocktails and fine wine. The bar offers six-pack sales and frequently hosts special events related to the city's liquor industry, including release parties for local beers and spirits. Dmitri's has been a Philadelphia staple since it was opened in 1987 by owner Dmitri Chimes. It is often credited with the rise of BYOB restaurants throughout the city, leading to their current popularity. The casual Greek spot is known for its seafood entrees, most notably its signature grilled octopus dish, and for its classic Greek offerings such as lamb and hummus. Two Dmitri's locations are open in the city today, including the original Queen's Village location and a second Northern Liberties location. Visitors to the to the Queen's Village location should note that it is cash only, though the Northern Liberties location accepts credit cards. As neither location takes reservations, both restaurants tend to fill up quickly on the weekends, so date night diners should plan accordingly for wait times. Bibou is a family-owned upscale French bistro, opened in 2009 in Bella Vista by husband and wife team Pierre and Charlotte Calmel. 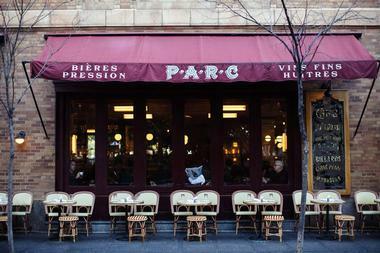 Today, the restaurant is widely considered among the best French restaurants in the United States. 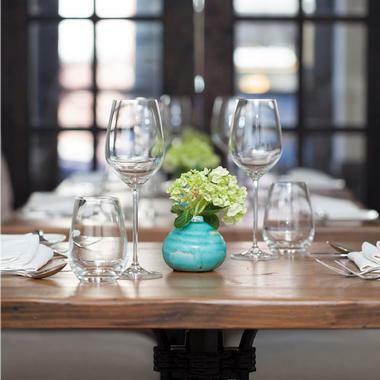 The BYOB establishment offers a custom seven-course prix fixe menu served Wednesdays through Saturdays in an intimate, relaxed setting, with advance reservations required for all diners. Guests are able to see the menu for their upcoming reservation in advance on the restaurant's website, along with suggested wine pairings. All visitors should note that credit card information is required at the time of reservation, and that any dietary restrictions should be mentioned along with the reservation to allow for accommodations and menu substitutions. South Philly Barbacoa got its start as a Philadelphia food cart in 2014, moving to several temporary venues in storefronts throughout the city before landing at its current two permanent locations. Its Italian market location shares its space with sister establishment El Compadre, serving its menu of traditional Mexican barbacoa-style meats on the weekends. A new location on the city's 9th Street also serves its menu of tacos and tortas full time, operated by husband and wife team Christina Martinez and Ben Miller. The restaurant has received national acclaim throughout its various incarnations, including a ranking at number six on Bon Appetit's 2016 list of the best new restaurants in America. All meats are cooked daily, including beef, chicken, and lamb prepared in traditional barbacoa style, with all tortillas for dishes made in house daily. 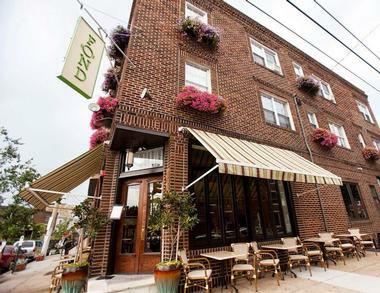 Fond is a New American restaurant opened in 2009 in the popular Passyunk neighborhood by chefs and husband and wife team Lee Styer and Jessie Prawlucki. Since its opening, it has been ranked among the best date night spots in Philadelphia, known for upscale gastropub dishes such as grilled duck hearts and crispy pork rillettes served alongside homemade breads and desserts. A expansive wine, beer, and cocktail menu is offered, highlighting local offerings. Seating is available in the restaurant's small interior dining room, intimate wood bar, and seasonal outdoor patio. Bar and outdoor seating allows guests to eat in a more relaxed atmosphere and sample bar-only dishes such as prime rib French dip cheese steak, while dining room seating provides access to two tasting menu options. Nord is a Nordic-style BYOB bistro opened in 2013 by Joncarl Lachman, part of the bustling food scene on Passyunk Avenue. 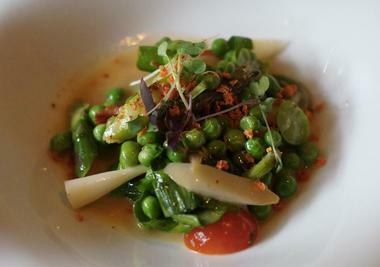 The restaurant serves up a variety of creative twists on traditional Dutch and Scandinavian dishes prepared with seasonal and local ingredients, receiving much local and nation acclaim since its opening. Notable menu offerings include rabbit and herring entrees, mussels, and keshi yena, a Netherland's style cheese casserole. Sunday brunch is also available, with menu options such as brisket hash and deep-fried French toast served alongside coffee, tea, juice, and speciality Nordic beverages. 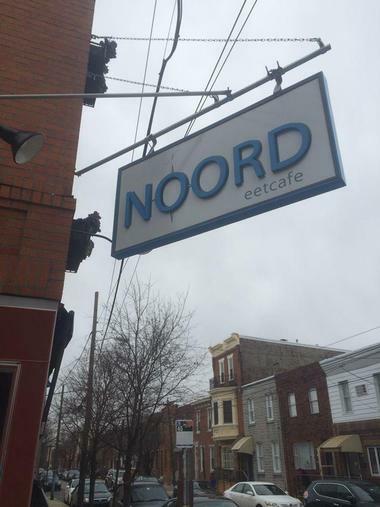 Noord is open Wednesday through Sunday, with reservations accepted for large and small parties. Laurel is the first solo restaurant venture from Top Chef Season 11 winner Nicholas Elmi, opened in Philadelphia's East Passyunk neighborhood in 2013. The intimate restaurant seats only twenty guests at a time, with additional outdoor seating available when weather permits. A gourmet seven-course prix-fixe chef's tasting menu is available, highlighting unique concoctions personally crafted by Elmi. Though Laurel is a BYOB establishment, its partnership with sister establishment In the Valley allows access to a full bar menu in addition to corkage services. Visitors should that due to Laurel's small size and growing popularity, reservations are required and tables are often booked months in advance. Dietary restrictions can be accommodated and should be communicated to the restaurant at the time of reservation. 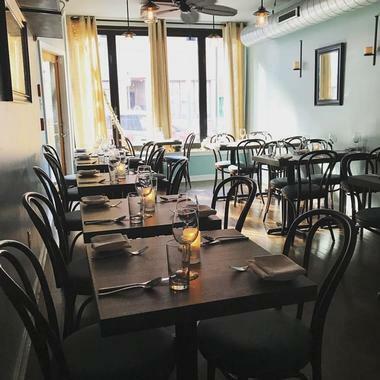 Townsend is an award-winning romantic French bistro opened by proprietor Townsend Wentz in 2014 inside a converted row home in East Passyunk. The bistro is frequently named among the top restaurants in Philadelphia, known for its elegant atmosphere, decadent sauces, and creative touches, along with one of the city's best carefully-cultivated wine lists. Guest are able to select their own items from a seasonally-rotating menu or opt for a five-course tasting menu personally prepared by restaurant chefs. In addition to its formal dining room, Townsend offers seating at its cherrywood bar every night, with a large list of cocktails, wines on tap, and service from its full dinner menu. Hardena is a traditional neighborhood Indonesian restaurant in a small, cantina-style setting, opened in 2001 by Ena and Harry Widjojo and run by their daughters, Diana and Maylia. Hardena is frequently named as the best Indonesian restaurant in Philadelphia and has received a number of local and national dining awards over its two decades of operation. Its authentic cuisine focuses on rich flavors and hearty portions of comfort foods, with many vegetarian options available. Notable menu items include ginger-fried chicken, jackfruit stew, lamb curry, and seasonal fish catches, along with rotating traditional dessert specials. Food is served in a buffet-style setting, allowing guests to try a variety of menu options. For larger parties, table service is also available. 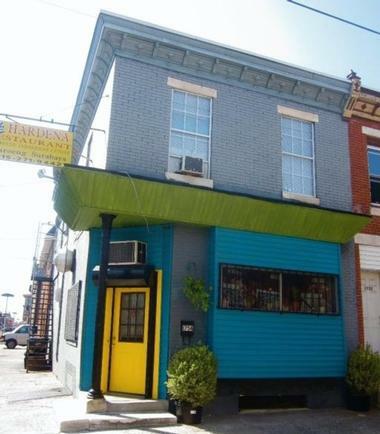 Will is a BYOB French bistro opened in 2012 on Passyunk Avenue by executive chef Christopher Kearse, who has frequently been named as one of the top chefs in Philadelphia. The bistro mixes modern techniques with classic French recipes to create innovative dishes that are crafted with locally-sourced and seasonal ingredients. Menu options change on an almost-daily basis, with many dishes highlighting fresh vegetable and seafood ingredients. Guests may select from the restaurant's a la carte menu or visit on Sundays for a four-course tasting menu highlighting farmer's market items. Additionally, on the third Wednesday of every month, a five-course tasting menu themed around a single ingredient is offered. Le Virtu is an award-winning Italian restaurant opened in 2008, dedicated to showcasing the cuisine of the country's Abruzzo region. It is helmed by head chef Joe Cicala, who was a James Beard Award finalist in 2016 for his work on the restaurant's menu. It is consistently named as one of the city's finest dining experiences, offering a full menu of traditional dishes crafted with locally-sourced ingredients. The restaurant cures its own meat on site using traditional Abruzzese methods and crafts all of its pastas by hand with ingredients imported directly from Italy. Its seasonally-changing menu focuses on meats, seafoods, pastas, and vegetable dishes, with wine, beer, and cocktail offerings available for pairing. Once a year, the restaurant also hosts its La Panarda event, a 40-course, nine-hour meal served according to Abruzzese tradition, paired with traditional Italian wine pairings. Good Karma Cafe is a casual breakfast, lunch, and coffee spot offering four locations in Center City, the first of which opened in 2008. 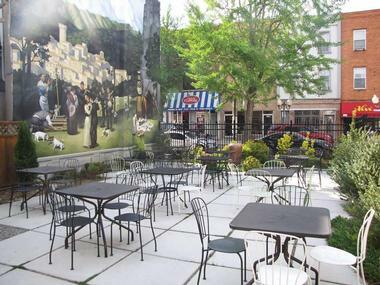 The original Good Karma Cafe is located in Fitler Square, with additional locations available in Society Hill, Schuylkill Banks, and inside the Wilma Theater. The Cafe is committed to sustainable business practices, environmental responsibility, and active stewardship within its local community. Fair Trade and organic coffees and teas are served in a variety of specialty coffee shop beverages, and breads, meats, and other ingredients are acquired from a variety of local partners. Menu items include bagels, sandwiches, soups, and salads, with ample vegetarian, vegan, and gluten-free options offered. 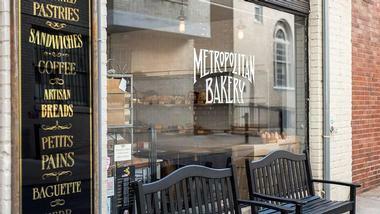 Metropolitan Bakery is a bakery and cafe chain offering four locations throughout Philadelphia, including locations in Rittenhouse Square, Reading Terminal, University City, and a full-service restaurant location on 19th Street. The company was opened in 1993 by Wendy Smith Born and James Barrett and crafts fresh-baked artisan breads daily, including cracked wheat, raisin nut, pumpernickel, and organic spelt and miche breads. The chain is also known for its gourmet pastries, famous granola, and wood-fired pizzas. The bakery has been awarded Philadelphia Magazine's Best of Philly award nine times and has received national attention from O the Oprah Magazine, Family Circle, and The Today Show. In addition to its physical locations, all of its breads and gourmet bakery items are available for purchase online and shipping throughout the United States. Parc is a contemporary homage to the classic French bistro, offering a wide variety of dishes with ingredients imported from Europe. The all-day restaurant offers breakfast, brunch, lunch, midday, and dinner service seven days a week, taking design and atmosphere cues from classic and modern French lifestyle. European-style coffee shop beverages are available to pair with French-inspired breakfast and brunch dishes such as polenta and eggs basquaise, Eggs Norwegian, and vol au vent, while upscale brasserie dishes such as escargots, fruits de mer, and steak frites feature on its lunch and dinner menus. A full wine menu is also available, along with an extensive craft cocktail menu and whiskey and liquor list. Cheu is a an Asian fusion ramen bar chain owned by Shawn Darragh and Ben Puchowitz, offering three locations throughout Philadelphia. The restaurant's original Fishtown location was opened in 2017 in a former horse stable and is the largest of the three restaurants, offering the most expansive menu. 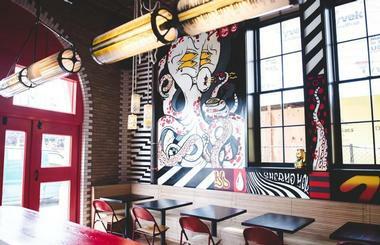 Its interior is completely decorated in graffiti and murals crafted by local artists and showcases an open kitchen where diners can watch as their dishes are prepared. Classic noodle dishes are served at all three locations, along with creative international fusion options such as ramen with matzo balls and bibimap with salsa verde. An extensive drink menu is featured, including draft beer, fine wine, cocktail, and sake options.